So ..I have gone crazy in a good way :) There is a Facebook group called Stitch Maynia.. In May they do 15 new cross stitch starts in 15 days ..I watched everyone have alot of fun with this last year so I decided I was jumping in! 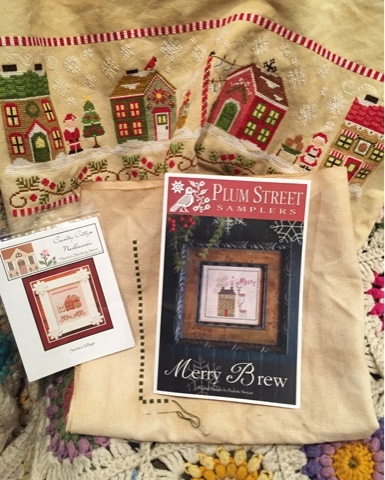 Yesterday for Day 1 I started 2 pieces..The Santa Stocking shop from Country Cottage Needleworks Santa's Village Series and also Merry Brew from Plum Street Samplers.It is adorable! 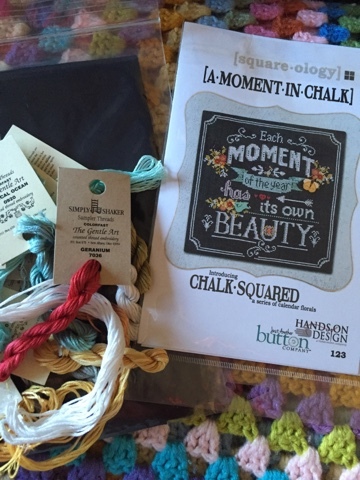 All I got stitched was some border on both of them ..
Today for Day 2 it is Hands On Design A Moment In Chalk .. aren't the colors pretty! For Day 3 which is my football playing sons birthday I am stitching this for him ( he doesn't read my blog ..I don't know if anyone in my family does :) But I am doing it chalkboard style ..The colors for his Football team at San Diego State are red and black so it is going to be all red and white stitching with maybe a little light grey ... I thought it would be fun to give to him before his first game this fall! 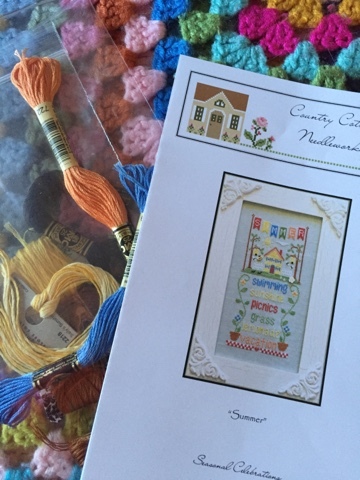 This is from Stitchrovia on Etsy..
Day 4 ..Summer from Country Cottage Needleworks ..I am only doing the top half just like Spring. 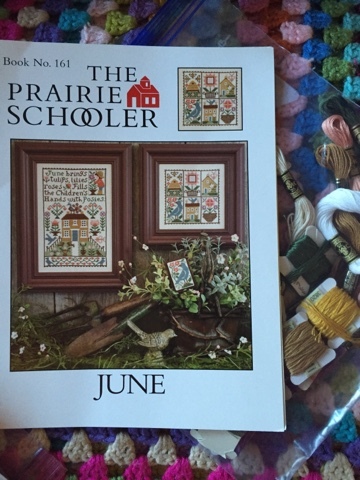 Day 5 Prairie Schooler June .. the next in the monthly samplers.. Love this one! Day 6 another Prairie Schooler ..knock knock.. I am not a fan of the orange for eyes and the windows so I will be using the gold for that. 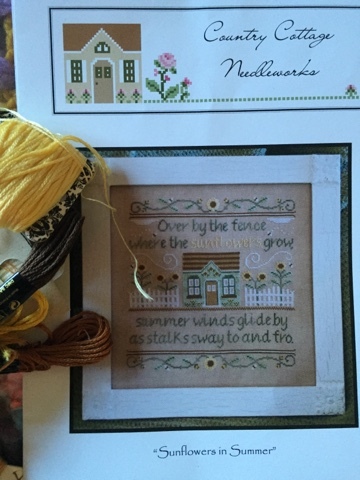 Day 7 Sunflowers in Summer from Country Cottage Needleworks. 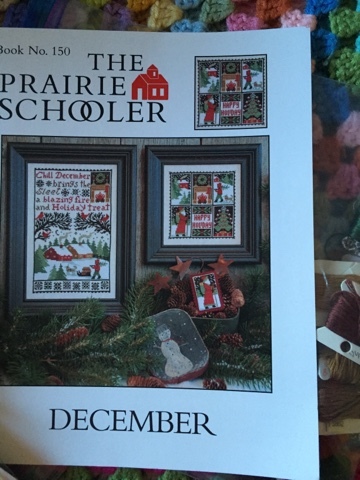 I think I am leaving out the words under the house and moving that border up ..
Day 8 Another prairie Schooler monthly sampler December..
Day 9 Frosty Forest from Country Cottage needlworks will get started. 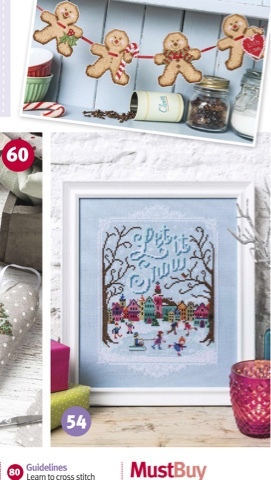 I am stitching each separately and have a very fun idea for finishing if I can find the vintage thing I am looking for at a flea market this spring/summer..
Day 10 from Cross Stitch Crazy Magazine this snow town piece.. The colors are so bright..way different from my usual but I will give it a start! So I have 12 starts here .. I may fill in a few days of 2 starts to bring the number to 15 ..Right now with my schedule that's the way things are shaping up.. I tried to do a 7 start stitch a long last year and only made it to 4 .. so we will see if this works out ! Every time I see your Santa's Village I think 'today I will take mine out' but I haven't yet got around to it. Great starts, all that you've shown. I particularly like the chalkboard pieces. Hi Priscilla! Oh, you've been busy! 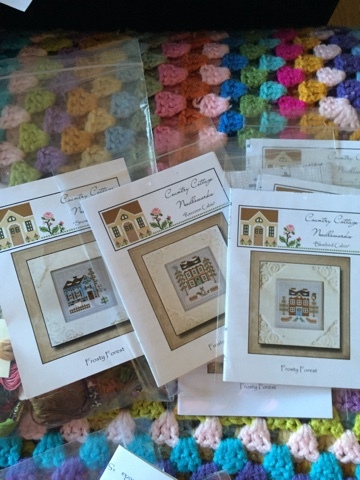 I just love your little stitcheries! You do a beautiful job and these are proof of that! Wow...I especially love the chalk design! 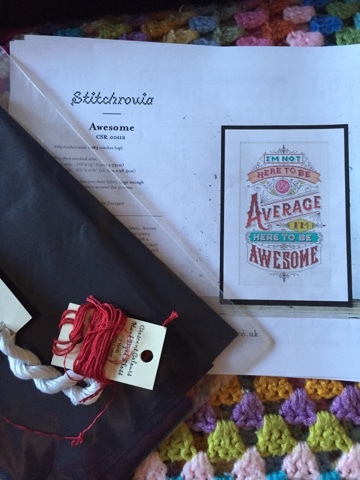 How are you finding so much time to stitch,when you are planning a wedding??? Please post on Instagram too Priscilla. 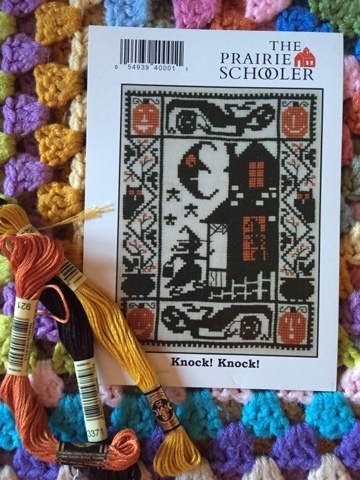 I just finished a Sunny Days Sampler from Prairie Schooler. I changed some of the colors as well. 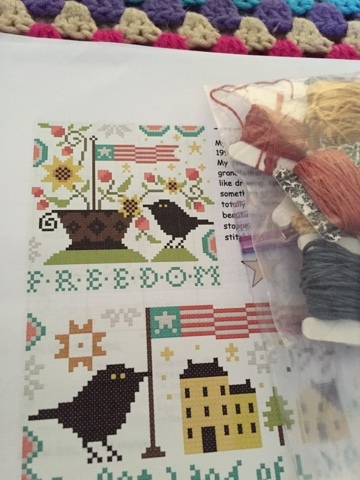 Now I am working on Freedom House by Little House Needleworks...then next will be Summer, an old Prairie Schooler pattern I had that I have not stitched. Love all your needlework and admire your speed!! What an ambitious adventure! I do love many of your choices especially the monthly PS charts. The last of my 15 Stitchmaynia starts!